Science comes alive with this colorfully illustrated book about matter. The book discusses matter in its different states: solid, liquid, gas, and plasma and contains pictures of real life situations. This book is designed to stand alone, or to be an informative companion to the iTunes U podcast series and course entitled Matter Matters!. 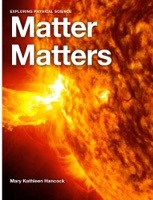 Written by a middle-school teacher, Matter Matters! explains science facts with examples that children ages 8-12 can easily understand, and addresses important Common Core standards.